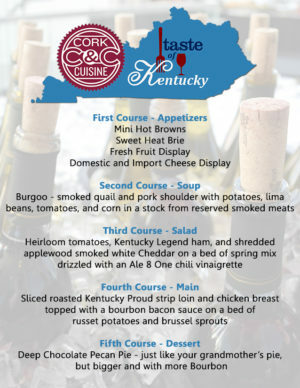 Cork & Cuisine – Taste of Kentucky is a five-course food, wine, and spirits pairing tour through the great Bluegrass state! Special wine gift giveaways also included! Tickets are $70 per person. Reservations Only. Special thanks to our sponsors, Creation Gardens, Coastal Wine and Spirits of Kentucky, and Val U Liquors.